In the scenario that none of the requested dates and hotel are available as advised by staff during booking, customers may choose to top up the difference for an alternative date of travel. 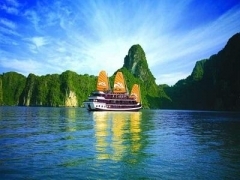 Hanoi, Vietnam: Only $688 per pax for 5D4N Hotel Stay + Hanoi & Halong Bay Luxury Tour + Daily Breakfast + Lunch + Dinner + Return Flight via Singapore Airlines. Min 2 to go. Delicacies (food): Vietnam Noodle, Spring Roll, Seafood, Couple Cake, Vietnamese Buffet, Mongolia Cuisine. Places of interest: Zhen Guo Temple, Halong Bay, Bich Dong & Bich Dong Pagoda, Three Caves. Located in Ba Dinh District which is the heart of Hanoi's cultural, historical and political center. It takes you just 5 minutes by taxi to Hoan Kiem Lake and Old Quarter and 40 minutes to International Noi Bai airport. Hanoi Delight Hotel comprises 68 graceful rooms ranging from Superior, Deluxe, Executive and Junior Suite rooms. The hotel boasts of beautiful decor and the hotel emits a peaceful and relaxing atmosphere. Our courteous and professional staff are always ready to serve you. Located in the East Hung Thang Road, Cai Dam Area, Quang Ninh Province which is a world acclaimed heritage site of the UNESCO. Crown Hotel stands just a hundred meters away from the calm and pristine waters of Halong Bay, where one can enjoy the clean breeze and a comfortable and pleasant stay at the Crown Hotel.